I absolutely love dressing up with t-shirts, dresses and hair pieces and channeling my favorite characters. One of my favorite clothing brands is Her Universe. Her Universe was created by Ashley Eckstein, the actress who gives voice to Ahsoka Tano in Star Wars: The Clone Wars Series. Ashley created Her Universe for Fangirls (like moi) who love all things sci-fi/fantasy. Point being, comic books and sci/fi culture is not just for boys. Girls can enjoy the fun as well. Her Universe intentionally creates exclusive pieces for female fans for brands such as Star Wars, Doctor Who, Star Trek, and Marvel. As the brand has been growing, more items featuring some of our favorite characters have been appearing. The release of Marvel's Avengers: Age of Ultron prompted some gorgeous new styles from Her Universe. The collection will be available online and at select Hot Topic Stores . This six piece collection will be available in straight and extended sizes. 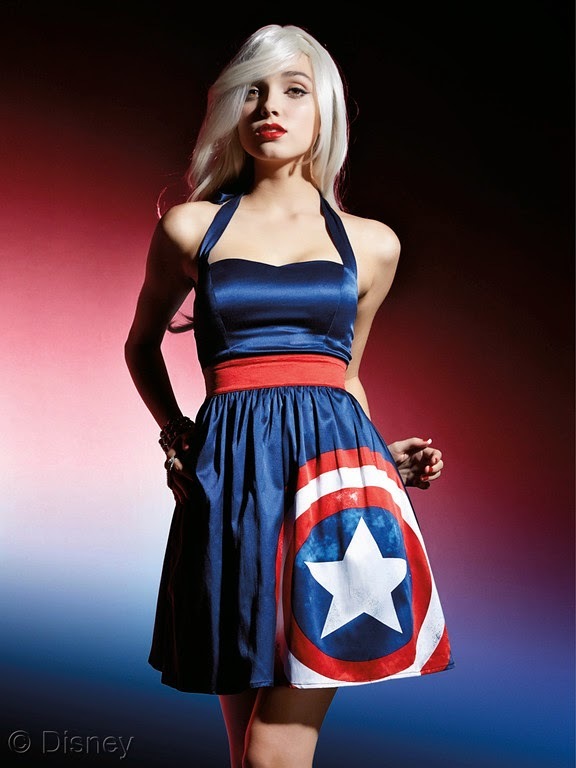 The Loki Halter Dress and the Captain America Halter Dress are my favorites. I can't wait to see what other goodies are lined up for Her Universe with the anticipated release of Star Wars: The Force Awakens. Check out this cool video talking a little more about the collection. Which is your favorite dress? Do you have a favorite Her Universe piece?